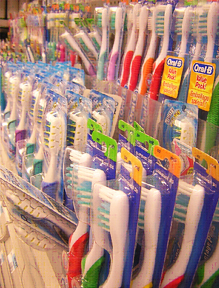 Look for soft bristles, they are easier on your gums and work well if you brush aggressively. Hard bristles and hard brushing can make your gums recede, and damage the roots of your teeth which can lead to more serious issues like periodontal disease. The head of the brush (where you place the toothpaste) should be small so you can maneuver it in tight places and into the back of your mouth. A ½ inch wide head is a good size. While brushing, many people focus on their teeth and neglect brushing their tongue. Many brushes come with a tongue cleaner on the back of the head, which you can use to remove any bacterial buildup on your tongue. Forgetting to brush your tongue can lead to bad breath or even halitosis so make sure to add this to your routine. Pick what feels best in your hand. It should also be long enough that you can reach the back of your mouth and other nooks and crannies. Other options available are non-slip grip, flexible, or angled handles: all of which are your personal preference. A larger non-slip handle may be beneficial if you suffer from arthritis. Flexible handles move with the contour of your mouth and decrease aggressive brushing. Angled handles can increase access to difficult to reach parts. If you suffer from arthritis or other mobility ailments, an electric toothbrush can assist you with the necessary motion for brushing, which otherwise might be too difficult. Studies have been conducted comparing manual and electric brushes and, for the most part, there’s no noticeable difference between the two (Source link). While electric toothbrushes are certainly more expensive, many come with neat features like timers to make sure you brush for the full recommended 2 minutes. If you’ve been using the same brush for over three months or you’ve recently gotten over an infection, we recommend picking up a new brush the next time you’re out. And with these tips, you’ll have no problem picking the one that's right for you! If you have any questions or want to discuss which toothbrush would be right for your individual needs, make sure to ask your dentist or dental hygienist during your next visit.